Washington has vociferously denounced Afghan corruption as a major obstacle to the United States' mission in Afghanistan. This has been widely reported. Only one crucial element is missing from this routine censure: a credible explanation of why American nation-building failed there. No wonder. To do so, the US would have to denounce itself. Corruption in Afghanistan today is acute and permeates all sectors of society. In recent years, anecdotal evidence on the subject has been superseded by the studies of researchers, surveys by NGOs, and periodic reports by the United Nations Office on Drugs and Crime (UNDOC). There is also the Corruption Perceptions Index of the Berlin-based Transparency International. Last year, it bracketed Afghanistan with two other countries asthe most corrupt. None of these documents, however, refers to the single most important fact when it comes to corruption: that it is Washington-based. It is, in fact, rooted in the massive build-up of US forces there from 2005 onward, the accompanying expansion of American forward operating bases, camps, and combat outposts from 29 in 2005 to nearly 400 five years later, and above all, the tsunami of cash that went with all of this. Last month, when an Afghan court sentenced Sher Khan Farnood and Khalil Ullah Ferozi, the chairman and chief executive of Kabul Bank, for looting its deposits in a gigantic Ponzi scheme, the event received some media attention. Typically, however, the critical role of the Americans in the bank's murky past was missing in action. Founded as a private company in 2004, Kabul Bank was promptly hailed by American officials in Afghanistan as a linchpin in the country's emerging free-market economic order. In 2005, action followed words. The Pentagon, paymaster for the Afghan National Security Forces (ANSF), signed a contract with the bank to disperse the salaries of ANSF soldiers and policemen. With that, the fledgling financial institution acquired an impressive cash flow. Moreover, such blatant American support generated confidence among better-off Afghans. Soon enough, they were lining up to deposit their money. Starting in 2006, the surging inflow of cash encouraged Farnood and Ferozi to begin skimming off depositors' funds as unsecured loans to themselves through fake front companies. Thus was born the world's largest banking scam (when calculated as a percentage of the country's gross domestic product) with the US Embassy in Kabul acting as its midwife. 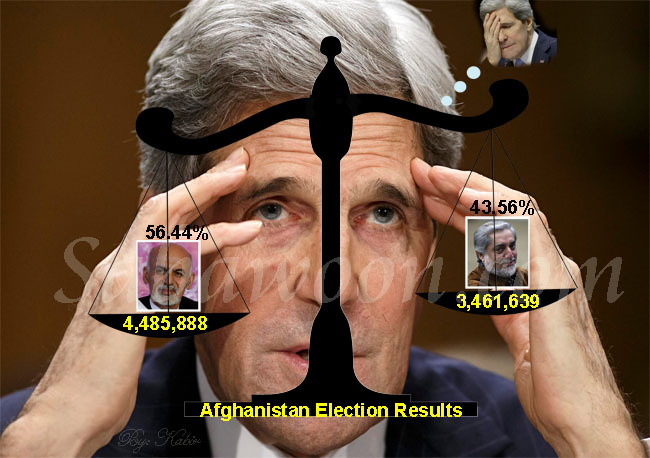 There exists a statistical connection between the sums expended by Washington in Afghanistan and worsening corruption in that hapless nation. It is to be found in Transparency InternationaI's Corruption Index. In 2005, Afghanistan ranked 117th among the 158 countries surveyed. By 2007, as American greenbacks poured into the country, only two of 179 nations surpassed it in corruption. Since 2011, it has remained at the very bottom of that index. What changed between 2005 and 2007? By the spring of 2006, the Taliban insurgency had already gained control of 20 districts in the southern part of the country and was challenging US and NATO forces in the strategic Kandahar area. With a sectarian war by then raging in US-occupied Iraq, secretary of defense Donald Rumsfeld felt that he could increase the American military presence in Afghanistan only marginally. This started to change when Robert Gates took over at the Pentagon in December 2006. He began bolstering US combat units there. As a result, forward operating bases multiplied, as did combat outposts and military camps. Building new sites or upgrading old ones on the double meant that the Pentagon started awarding contracts to local Afghan construction companies unaccustomed to handling such tasks quickly. They, in turn, subcontracted tasks out to those who greased their palms. With the infusion of ever more piles of Pentagon dollars, corruption only spread. Between 2005 and 2007, when American combat forces in Afghanistan doubled, the Pentagon's budget for the Afghan War leaped from US$17.2 billion to $34.9 billion annually. ANSF personnel also doubled, from 66,000 to 125,000 troops and policemen, though at a relatively marginal cost to the Pentagon. At $16,000 a year, the burden of maintaining an Afghan soldier was a paltry 2% of the $800,000 it cost to maintain his American counterpart. In this period, opportunities for corruption rose exponentially. Why? In part, because the Pentagon was unable to protect the supply convoys of its Afghan contractors, something that would have required tens of thousands more US troops. The distance between the main supply center at Bagram Air Base near the capital Kabul and the city of Kandahar in the Taliban-infested south was 300 miles (480 kilometers); and the Taliban heartland in Helmand Province lay another 100 miles from Kandahar. Since Afghanistan lacks railroads, the only way to transport goods and people was to use the roads. The Bagram-Kandahar highway was peppered with roadblocks, each manned by the armed fighters of the dominant warlord, who collected an arbitrary ''transit tax''. The only way the transport companies could perform their job was by buying safe passage from the rulers of the highway and so parting with bribes of approximately $1,500 per truck between Bagram and Kandahar, and another $1,500 between Kandahar and Helmand. All of this came from the cash the Pentagon was so profligately doling out. The warlords and private security contractors, in turn, gave bribes to the Taliban for the safe passage of these convoys. In essence, therefore, the Pentagon was helping finance its enemy in order to distribute necessary supplies to its bases. In addition, on ''safe'' roads, checkpoints were often manned by Afghan policemen, who extorted bribes by threatening to pass advance information about a convoy on to the Taliban. Then there were the petty bribes that ordinary Afghans regularly pay to civil servants and policemen. These are extracted from citizens for favors or preferential treatment by officials in public service ministries when it comes to such basics as gaining entrance to school for a child, securing a bed in a hospital, or getting a driver's license or building permit. They represent a commonplace phenomenon not just in Afghanistan, but also elsewhere in South and Southwest Asia. While ignoring Pentagon-financed sleaze on an industrial scale, the NGOs and UNDOC go through the ritual of quantifying corruption in the country by questioning a sample of Afghans regarding the small bribes - popularly called baksheesh (literally, ''gratuity'') - they pay to public officials. They come up with such earth-shaking conclusions as that 50% of the population paid a bribe in 2012, ''down'' from 58% in 2009 (the year of the previous survey). A 2009 survey by Integrity Watch Afghanistan (IWA) focusing on petty or administrative corruption put the total for such bribery nationally at $1 billion - less, that is, than half the $2.16 billion that the Pentagon disbursed in a single gigantic contract under the label of ''Host Nation Trucking'' for ferrying supplies to its bases. Another major source of systematic corruption: the filching of Pentagon money via salaries paid to ''ghost soldiers'' and policemen, recruits enrolled in the Afghan security forces who don't exist. Here, too, Washington's funds became the basis for embezzlement and ''Afghan'' corruption. Besides filching salaries, enterprising police and army commanders have made money by reselling Pentagon war materials. For instance, according to documents leaked by the whistle-blowing website WikiLeaks, a police chief in the eastern town of Zurmat reported fictitious firefights with the Taliban, and upon being restocked with thousands of rounds of ammunition, sold them to a bazaar merchant. Another provincial police commissioner purloined food and uniforms, while leaving his men cold and underfed in the winter. Such acts led to the creation of a significant black market in US military equipment and goods of every sort. In its drive to win the hearts and minds of Afghan villagers, the Pentagon's policymakers also gave cash directly to US officers to fund the building of wells, schools, and health clinics in areas where they were posted. The stress was on quick, visible results - and they were indeed quick and visible: the funds generally ended up in the pockets of rural power brokers with little oversight and no accountability, particularly when the American officer involved usually left the area after a relatively brief tour of duty. Later, the State Department's Agency for International Development (USAID) took over this role. As with the Pentagon, most of the money it distributed ended up in the pockets of those local power brokers. By some accounts, USAID lost up to 90 cents of each dollar spent on certain projects. According to a congressional report published in June 2011, much of the $19 billion in foreign aid that the US pumped into Afghanistan after 2001 was probably destabilizing the country in the long term. Staggering amounts of US taxpayer dollars allocated to aid Afghanistan were spent so quickly and profligately that they circumvented any anti-corruption, transparency, or accountability controls and safeguards that existed on paper. However, those who amassed bags full of dollars faced a problem. Afghanistan's underdeveloped $12 billion economy - a sum Washington spent in that country in a single month in 2011 - did not offer many avenues for legitimate profitable investment. Therefore, most of this cash garnered on a colossal scale exited the country, large parts of it ending up in banks and real estate in the Gulf emirates, especially freewheeling Dubai. Kabul Bank caught the essence of all this in a single Afghan institution, the brainchild of an Afghan who stood out as a man for all seasons. In their enthusiasm to welcome the founding of an ambitious private bank, American officials, wedded to their free-market theology, overlooked the shady background of Kabul Bank chairman Farnood. An ethnic Uzbek, he moved to Moscow during the Soviet occupation of Afghanistan in the 1980s. Toward the end of that decade, he started an informal money transfer business, or hawala, that would prove useful for drug smugglers who wanted to transfer their cash into Afghanistan and the adjoining Socialist Republic of Tajikistan. The Russian interior ministry pursued him, but by 2007, when it got Interpol to issue an arrest warrant for him, he was the honorable chairman of Kabul Bank (with his former bodyguard, Ferozi, as its chief executive officer). And his bank had acquired nearly a million customers, including 250,000 Afghan security soldiers and policemen. Unsurprisingly, the interior ministry in Kabul ignored the Interpol warrant. So apparently did the US Embassy in Kabul. When news of his jaw-dropping embezzlement and Ponzi scheme broke in September 2010, USAID officials expressed surprise and shock. They would have had to be blind and deaf not to have seen or heard the dark rumors about their star financial institution that had already been swirling around Kabul's diplomatic and financial circles. They could not, however, maintain the charade of ignorance once WikiLeaks published Kabul embassy cables, some of them dating from 2009, mentioning the bank's scandalous transgressions. By September 2010, almost $1 billion had gone missing from the bank, with Farnood and Ferozi pocketing $900 million, significant amounts of which they invested in luxurious villas in Dubai. Last month, a few liberal Western journalists made a point of the way Afghan judges had dropped the most serious charges of embezzlement, forgery, and money laundering against Farnood and Ferozi, convicting them instead of ''breach of trust''. However, none of the journalists or commentators pointed out the inconvenient fact that US officials had heartily approved of the bank's founding, had helped raise its stature and improve its cash flow, and had later overlooked the egregious misdeeds of its prime founders. In the next two years, as Washington draws down its forces in Afghanistan and the situation there disintegrates further, there will undoubtedly be more stories about ''Afghan'' corruption. Given that, it's well worth recalling the following facts: it was the US that flooded the country with military and aid funds, while expediently skipping any process of oversight, and so turned Operation Enduring Freedom into Operation Enduring Corruption.